Christmas In Williamsburg [D5761] - $10.00 : Yarn Tree, Your wholesale source for cross stitch supplies. 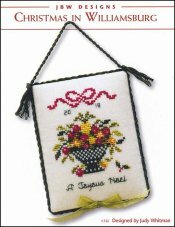 Cross stitch pattern by JBW Designs. It's "Christmas in Williamsburg!" This beautiful pot of Christmas floral is stitched in the middle of this design. Below the pot, "A Joyous Noel," is stitched. Stitch this design as a Christmas ornament for your Christmas tree! Stitch count is 37W x 52H. This design can be stitch on #2181 Zweigart Belfast Linen Antique White 32ct. or #2007 Zweigart Cashel Linen Antique White 28ct.